Here I sit, my belly full of barbeque brought home from the auction, and a light dusting of snow (snow!) outside. And I turn on the TV, and this is what greets me. 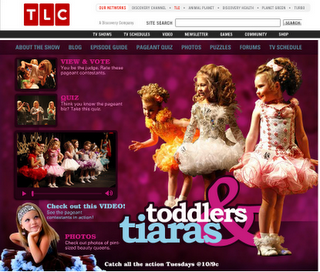 Toddlers and Tiaras. I watched it a few nights ago, and I thought maybe the folks I was seeing on it were flukes. Surely, there are only a handful of parents and kids out there like this, right? Last time, one of the families was a black lesbian couple from Jackson, Miss., with three girls. The two older girls, who were about 4 and 7, were the ones competing. They made all their own pageant clothes, and y'all, I watched the two moms (along with their fashion designer/stylist friend) spend more at Hobby Lobby on stuff to make a couple of dresses than I pay in rent each month! And not to be judgemental - but they were obviously living in public housing. Another family from my last viewing had two girls, the older one a confirmed tomboy and the younger the classic girly-girl. I kind of wondered if the mom pushed the younger to compete because of some deep-seated, subconscious resentment that her older daughter wasn't "girly" enough. I was disappointed mostly with the attitudes/actions of the parents. After all, the kids are just doing what they've been programmed to do. Like, say, wear false teeth because it's obviously not acceptable for a six-year-old to have a gap where she's lost her tooth. Or, prance around on stage in skimpy outfits and shake what their mamas gave them just a few short years before. Today, there is a two-year-old whose father makes her pageant wear and is obviously more interested in her winning than she is. There are also several mothers competing against their daughters for the grand prize. There are hair pieces, and fake tans, and false eyelashes. I honestly don't know how these folks afford their "hobby" - the grand prize is only about $1,000 - $5,000 cash, and they've got to be spending much more than that on lessons, and spray tans, and spangly dresses. Not to mention travel to the pageant, and staying the weekend at the hotel! Just for the sake of argument, I asked Anna Marie what she'd do if I tried to dress her up and put her in a pageant. "I'd run away," she answered, not missing a beat. Yeah, I think I'd run away too. Far, far away. 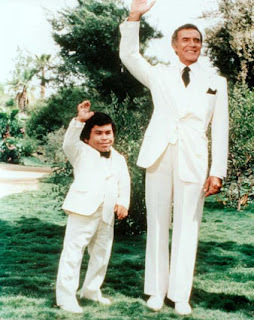 Am I the only one around here old enough to remember watching Fantasy Island on Saturday nights as a kid? And getting scared half-to-death? Sigh. I'm typing this on the desktop, because it appears that Jason didn't bring the laptop in when he came home from work. And now he's gone, and I'm here at home, and I've just realized what he's getting for Father's Day this year - a more comfortable office chair. If you follow me on Facebook - and really, that's probably the worst thing to happen to my actual blog in a very, very long time - you know that I'm mother to a sick little girl. Except - she isn't acting sick! Well, she did on Monday. She came home from school and took a nap! And then I came home to find her all lethargic, lying in her "Hippo Chair" watching television. Complaining that her legs were achy. And I took her temperature, because only a fever could make her act that way. Yup. Bring on the Advil. Monday night before bed, she's fine. Tuesday morning, more fever. I felt worse than she did yesterday, so much so that I fell asleep watching TV. I never do that. Never. After a couple more rounds of fever-fighting Advil yesterday, she woke up this morning ready to go. I took my fever-free daughter to school and hightailed it to work to get started, only to get a call from the assistant teacher about 9 a.m. I went to pick her up, and I could tell she just wasn't feeling well. She had what my mother calls "weak eyes." I took her to work with me, and then Jason let Amanda leave the auction and come back down to get her. By the time she arrived, we'd made the decision to take her to the doctor. Amanda took her in, and miraculously, they were seen within a few minutes. A flu test was administered. Did you know they can do that now - stick a Q-Tip in your nose and tell you if you've got the flu? Guess when you don't have health insurance, you're sort of out of the loop on these things. It came back positive, and the doctor (oddly enough, named Anna Mary) said that she must have a very strong immune system, because she looked pretty good for someone with the flu. They were finished about lunch time, so I took the two AM's out to Subway for lunch. Amanda brought the little one back to my house, and I braved the wilds of Walmart for the Tamiflu that was prescribed. She has to miss the rest of the week of school. But she's acting like she isn't sick at all! She's eating fine, she's playing - the only way you'd know she was ill was to look at her eyes, or maybe at her flushed cheeks if she's running a fever. So now, Jason went to choir practice, and I'm here with Anna Marie. Several miracles happened today - Amanda was able to watch Anna Marie; we caught the flu in the early stages, so we might not need antibiotics; I finished my special section; and Jason brought home dinner, so I didn't have to cook! As sad as she is to be out of school, she did learn the magic that is getting your mom to check you out. She told Amanda while they were waiting at the doctor that she wished she had a phone, so she could call me every day to come get her. She's gone from a H.A.T. (Here All the Time) kid to a truant, in one easy step. I did at least call the school for today's work so she won't be swamped when she goes back. And she was thrilled. Thrilled! I have one funny kid. I'm just praying that Jason's strong immune system, and my flu shot, hold up through this ordeal. And it wasn't as bad as I thought it would be - MUCH less complicated than the recent Reading Fair fiasco. I put together the internal structure - a Capri Sun box, opened to make a rough triangle, with cereal box cardboard covering the bottom and front and back openings; an oatmeal box for a head; and a toilet paper roll for a neck. 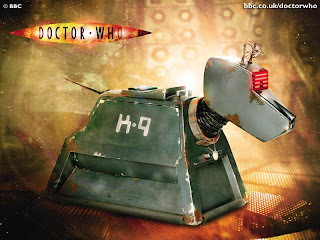 He's Doctor Who's canine companion, who now lives with Sarah Jane (one of the Doctor's former companions). Anna Marie first saw him on The Sarah Jane Adventures, a Doctor Who-type show geared towards kids. She LOVES that show, and she can't wait for the new season to begin. I explained to Anna Marie from the get-go that ours was not going to look like the original. We did the project on my bed, with the laptop showing the above original picture for reference. She was OK with the project, and its deviation from the norm. We figure it'll be the only robot dog brought in today, and certainly the only one from a much-beloved British sci-fi show. 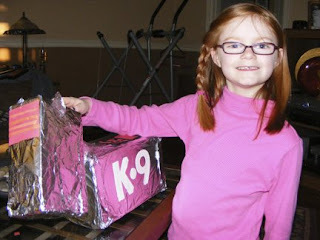 The only problem is, last night while we were searching for an image, she saw a radio-controlled model. Now, that's on her list - at $60! Maybe I should've just made a Dalek instead. Maybe she wouldn't have thought them so cute! I figure as long as that gym I've joined has a scale, I may as well use it. First thing in the morning, before I've had anything to eat or drink, so that won't be affecting my weight. Now, let me just say, it's one of those doctor-type scales, and I'm not completely sure I'm using it right. But - yesterday, I weighed 149, which would be a half pound loss from the last time I weighed in about a month ago. And today, it was 150. I know I didn't gain a pound overnight! I blame it on the Chinese food I had for dinner last night. And on the increase in exercise, because we all know that both of those things will make you retain water! So, I'm going to split the difference, and say 149.5, which is the same as I weighed before. I got back on the recumbent bike today, and LAWD, it was hard. It's supposed to increase the resistance once your heart rate gets up to its target, to keep you from over-shooting, but it was SO HARD to pedal from the get-go that I was sore (to the point of not being able to move my legs) within the first three minutes. So I set it to manual mode (where I control the resistance! BWAHAHAHA!) and it was much better. I think there may be something wonky with the machine I was using (it also kept saying my workout was paused, when it wasn't) but there isn't any staff there at 5 a.m. so I couldn't report it. I'll let some more experienced gym bunny fail on it later today, when someone is around to complain to! Well, actually it was last night, but I was too tired to post this then. It all started when I joined the gym yesterday morning. Of course, being in the middle of the work day, I didn't work out, I just paid my fee. I had to work late last night, but I'd decided that if I got finished at a decent time, I'd go by the gym. I had my clothes with me and a gym bag and everything! My meeting was over by 5:45, so I figured that I could get in a half hour and still be home before too long. Whoo boy - I did the recumbent bike, and my thighs really felt it! I had my iPod with me, but I never used it - the exercise machines all have little TVs, and I just plugged my earbuds into that. I did a cool down, and headed a few doors down in the strip mall to Subway to pick up some dinner. It was there that my troubles began. I was wearing a pair of the capri workout pants I'd found on clearance on Monday, along with a long-sleeved T-shirt with a short-sleeved shirt over it. I looked fierce! I also, unfortunately, had my heavy wool coat on, because it was so cold outside. But inside that Subway it was roasting! And the line was really long, so I had to wait quite a while. By the time I was ordering my Veggie Delight, I was starting to feel sick to my stomach. I was afraid I'd throw up right there - but that would've been preferable to how I began to feel. First my head started "buzzing." That's the only way I know how to describe it. It was like when Anna Marie and I had been playing around with some massagers at Walgreens once, and she put it on my head - except much more intense. I tried putting my head down close to my knees, to see if that would help. Obviously, it didn't, because then I started to lose my hearing! I literally felt like my ears were closing up. Not good! The middle-aged woman who was making my sandwich asked if I was ok. She advised me to sit down, and asked if I'd like some water. I told her that would be nice, and that I thought I'd overheated at the gym. I took off my coat, sat down, and the next thing I knew there she was with a bottle of Dasani she was pouring into a cup for me. She also poured cold water onto a napkin and rubbed my wrists, my forehead, and the back of my neck. Immediately, I started to feel better. It was like my body temperature dropped all of a sudden. She (who happened to be black) bent down and whispered in my ear, "You know you white girls can't take getting overheated like that!" She asked if there was anyone she needed to call, but I knew Jason was already in his PJs watching TV in bed, and that Anna Marie had already had her bath and was in hers too. I figured that if I was feeling better, there was no use in calling them. After sitting there for about five more minutes, I got back up. The line had disappeared by then, and I finished my order and came home. I thanked her profusely, and I have a good mind to call the owner (who is also an alderman in our town) what a great job she'd done. I don't know what might have happened if someone hadn't been around who knew what to do - because although I did, I wasn't functioning properly and couldn't have done it to myself. She said she was teaching a class once and a boy got overheated, and that she remembered the directions the nurse had given her. What are the odds that she'd be working at the same time I needed that exact help? I dare say that the teenagers who normally staff that restaurant wouldn't have been as knowledgeable. I went back to the gym this morning - I'm going to have to go early in the morning, before my family and my job need me - and I took some precautions. Short-sleeved shirt, bottle of water, etc. This was even worse than when I got overheated during the 5-Star races a couple of years ago. I learned my lesson last night - and I never, ever want to have that experience again. To describe how funny I find this sign. Especially when I imagine Barry White saying it. Guess it's a good thing I went to Walmart this morning and spent $23 on four pair of workout pants and one shirt, and plan on joining a $15 a month gym later today. For an extra $10 a month, I could have a tanning package at the gym too, but really, who am I kidding? I need those cancer-causing UV rays like I need a hole in my head. But I do need to get down to that gym - because I've had the misfortune to meet a few hamburgers in my lifetime, and it's looking pretty impossible to make my waist slender. But I don't want to give up! Have you gotten your kids their Valentines Day cards yet? No? Are you like me, and you don't really care for the overly-priced, overly-commercialized fare at your friendly neighborhood Big Box Store? Or are you making them by hand, lovingly crafting each and every one with your scrapbook supplies? Well, never fear. I have rounded up a few FANTABULOUS, PRINTABLE Valentines card ideas! These are really cute, and if I'm reading the info correctly, they're FREE! Etsy also has several designs that are inexpensive to download. Man, do I ever wish I was this talented! I love these too, and they even come in a version that you can color. Fancy! 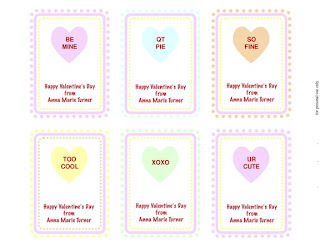 I kinda wish I'd seen these like, two days ago, before I did Anna Marie's cards. They're tres chic! Alas, I did not see those, but I saw these and they're the ones I pulled into Quark, put her name on, PDF'd, and printed out. I cut them out last night while I was watching TV, and voila! Instant Valentines! Yeah, I do work somewhere with access to all sorts of graphic stuff, and I could've designed them myself, but this year, I figure I'll leave all that designing to people who are, you know, good at it. Now, if we could just figure out some resource for the men in our lives who wait till the last minute, we'd really be in business! You'll have to excuse my less-than-stellar hearing this morning. You see, the suite we were blessed with - that awesome, awesome suite - was perfectly level with a bank of speakers. It was loud peoples. Really, really loud. The evening couldn't have gone better. I have learned that when I try to figure out and plan things, they often go awry. But when God works them out - well, He's much better at this stuff than I am. This has been a hard week, because on top of the usual meetings, I've been sick, and I've spent the better part of three days getting my Better Newspaper Contest entries prepared. Long story short, I was coming up a bit behind in my regular work. When I got back from lunch yesterday (I'd spent the first half of the day finishing up the BNC) I had a note that said I was to expect an article that afternoon from one of our writers (which, incidentally, we'd been waiting on for TWO WEEKS ALREADY). That article was going to save my sick/busy/TobyMac lovin' behind. After much prayer, nail-biting, and anxious emailing, the article came in just in time to allow me to leave early and get ready for the concert. Do you know what that meant? That meant that Jason and I were being invited to sit in the suite with the folks from our church who had the hookup! I had heard about the suite, but I figured it was going to be filled with teens and young adults and old fogeys with us were in with the flotsam and jetsam of the general population. I text back: For real? Because that's my answer for anything that I can't believe - for real? The answer came: The suite holds 18. With you guys, we should have 18. As our music pastor is wont to say: SWEET! Amanda got to my house to watch Anna Marie just in time for Jason to take me to a proper, sit-down dinner - at Zaxby's. I had been afraid we'd have to drive through somewhere, but, like I said - just in time. We got finished at Zaxby's and got gas, and got to the Civic Center just in time that we didn't have to wait but a few minutes in the bitterly cold wind. The door we went in? Right next to Suite 12! We closed the glass doors at the front of the sweet suite, and that deadened the noise just enough to make it bearable. Jason and I spent the majority of the concert behind those doors, half watching the show, half hanging out with our friends. And - and! Our Pastor Bob had gone backstage before the show to pray with the other pastors, and brought Brandon Heath back with him! Pastor Bob's next-door-neighbor, who was with us, is a HUGE fan, and he got to have his picture taken with him! When Brandon Heath and TobyMac did their sets (like, the very end of the evening) we did to out into the seating section of the suite. Of course, TobyMac was the very last act, and the longest set, and also, I think, the loudest. Jason ended up going back behind the doors, and I went back there occasionally to give my poor eardrums a rest, but the remainder of the set - I was out there, singing along and dancing like some 15-year-old. Our sweet suite was right by the door, which was close to where we'd parked, so we didn't have to wait for the crush of 10,000 teens to leave and we got out of the parking lot before the major traffic started. We old fogeys were back home by 11 p.m. Unfortunately, my ears were ringing, making it pretty difficult to sleep. But, it was totally worth it! I have learned that not only does God work things out better than I could have, He also provides blessings that I don't deserve and certainly couldn't afford. The suite was comped to Pastor Bob because he's reserved a suite for a Gaither concert next month. It made the Christmas present from Jason - money for the tickets - all the better. I was so touched that we were considered by our friends to share in their blessing, and words can't describe how grateful I was to them for the honor. There were lots of other folks they could've invited, but they chose us. God is good, TobyMac is loud, and my ears are ringing. Ok, so it isn't 10 p.m. It's more like 12:30 p.m. local, and I'm feeling the need for a nap because of the Chinese food I had for lunch. Dude, the Sickness, it is trying to come on strong in the Turner household. Friday night, Anna Marie had an "episode" in the car, and by "episode" I mean "throwing up all over herself, the seat, the car mat, and one of her Webkinz. In the parking lot of Kroger. She had been complaining that she wasn't feeling well, and she wouldn't eat her dinner, and then the next thing I knew, bam - there she goes. And at home. All night long. The poor dear slept with a towel under her, and a trash can beside her. Old school style! She recovered by Saturday night - longest 24 hours OF.MY.LIFE. So, we went to church on Sunday and then to the most awesomely awesome Super Bowl party at the home of our friends Brooke and Ron. As I said in the RSVP email, the Turners might not even know who is playing, but we love food, and we love our Small Group peeps, so we were there! If you're on Facebook, I was tagged by our hostess Brooke in some photos from that night. Look it up! Monday morning, I had a board meeting to cover and I called Jason when it was over to see if he was back from his trip to Memphis yet. He wasn't. And he asked if I could pick Anna Marie up from school when the time came, because he planned to go to bed when he got home. He did just that, too - while I was home eating lunch, he came in and went straight to bed. He didn't get out for the rest of the night, except for a few minutes later that night when I was coming home from another meeting, and he was trying to get Anna Marie to bed. He did go to work yesterday, but on my way to take Anna Marie to school, I felt - nauseous. And then I felt achy. And so I took some Pepto, drank a diet Sierra Mist, and went on in to work. Not because I didn't have a sick day to take off, but because I had too much to do at the office. After a couple of hours at work, I couldn't take it anymore and went home. I tried to rest for a few hours, but the city was working on a gas pipe two doors down, and it was LOUD. I just did the best I could. I did feel better after the rest and some ibuprofen, but I still felt kind of run down the rest of the day. Fingers crossed - we all three seem to be up on our feet today. I can only surmise that the flu shot my employer so graciously provided me with at the beginning of the winter has helped me avoid the worst of whatever is going around. I sure hope we're all well because - dude. Tomorrow night. 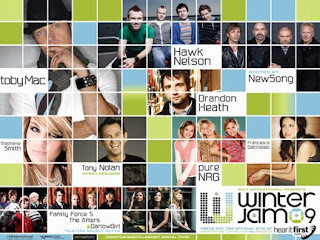 Winter Jam. I've been looking forward to this for months, and nothin's gonna keep me from my TobyMac. After all, I saw the second Lord of the Rings movie through a full-blown case of the flu. Surely I can muddle through this concert with a little fatigue, right?